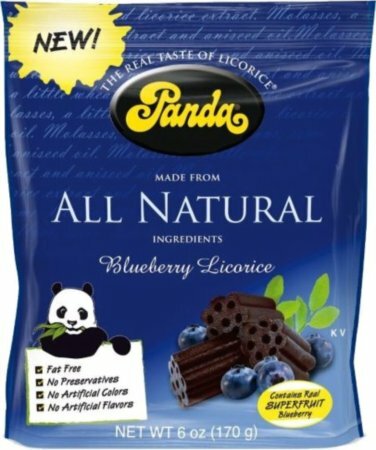 I grew up around just plain black and cherry licorice and usually only the thin laces, so trying this soft eating licorice was very unique. I received 4 flavors of the Darrell Lea Soft Eating Licorice for review: strawberry, mango, green apple and black. 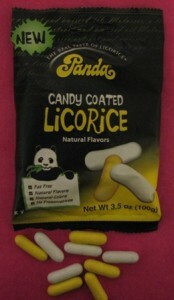 The bags are full of thick tubes of licorice, as you can see from my photo of the green apple flavor. Weâ€™re talking 2 inch long tubular pieces that are half an inch in diameter. So, if youâ€™re a licorice fan, these definitely are worth it for serving size alone. However, as a Candy Addict, I cannot go by portion size alone. 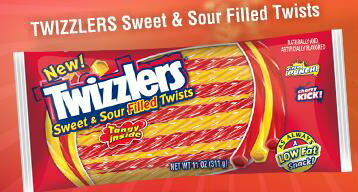 The last few Twizzler spin-offs havenâ€™t really been anything special for me. Despite the popularity of the cinnamon variety, they just werenâ€™t my thing. The same holds true for the less popular Rainbow Twizzlers. Actually, I donâ€™t really care for any Twizzlers that arenâ€™t the strawberry or cherry flavors. At the All Candy Expo, I was given a complimentary tote bag to lug around all the goodies I would be receiving, and it happened to be already filled by an assortment of products, including those donated by Hershey’s. I guess they were trying really hard to make sure no one in press missed any of their new products. It wasnâ€™t until I began cataloging my hoard that I even noticed the red and yellow Twizzlers in my bag. â€œNew Twizzlers Sweet and Sour Filled Twistsâ€ the wrapper advertised. I wouldnâ€™t have every picked these up at a store, but since I was given them it couldnâ€™t hurt to try them. When your apartment is routinely inundated with candy samples from various companies, it really means something when you consistently return to one box in search of your daily sugar fix. In the past few weeks, that box has been from Fini. When I first got an email from Fini, I wasn’t sure what to expect from them. They’re a Spanish company and I had no idea what they made or how well they made it. They asked what we’d like to review, and I just asked for whatever they could spare. And boy, did they come through! I got a giant box full of various kinds of candy – gum, filled licorice, gummies, and more. I barely knew where to start! Luckily, that didn’t stop me for long.